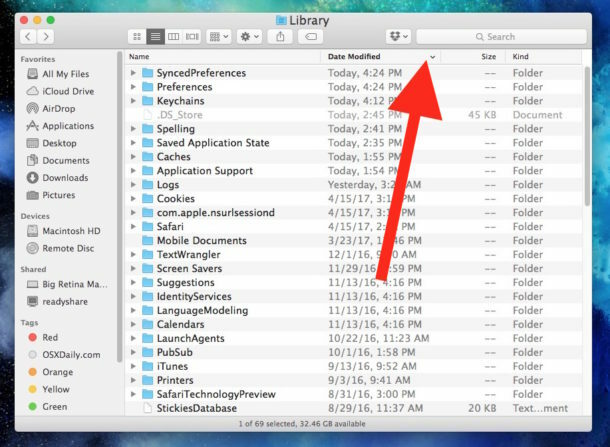 Many Mac users sort their files by name and type, but one of the most useful ways to sort files is by date. 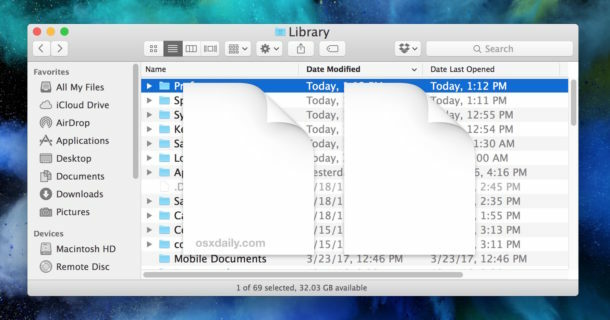 The Mac Finder allows for various different date based sorting options for files, documents, applications, and folders, and they’re all typically best utilized in the Finder List view. 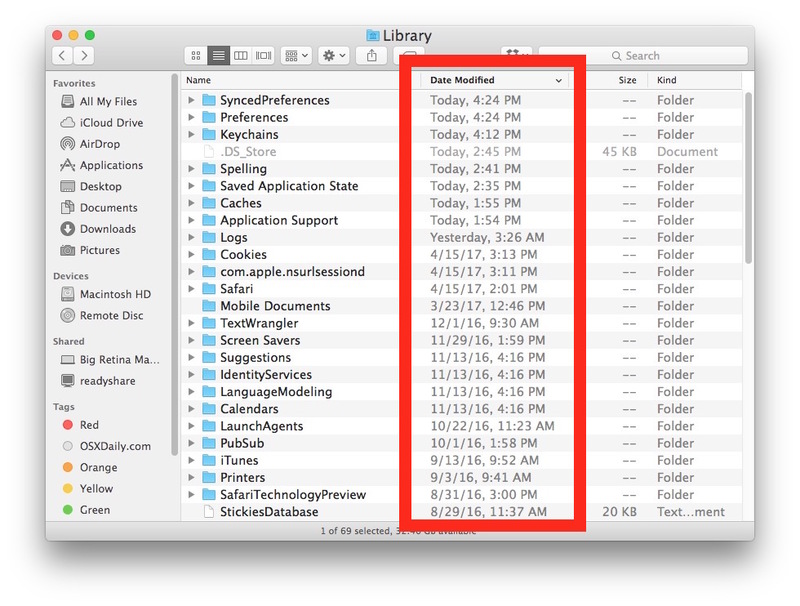 Using date based sorting in Mac OS, you can sort files by “Date Modified”, “Date Created”, “Date Last Opened”, and “Date Added”. 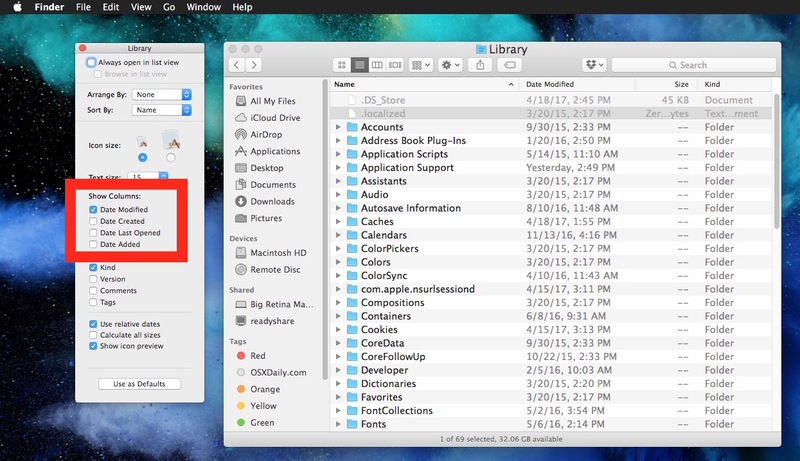 If you’ve never used these features before, or perhaps just forget they exist, this tutorial will walk through how you can use date based file system sorting on your Mac. These options are available in basically every version of Mac OS and Mac OS X to exist, it should not matter what system software release you are using. 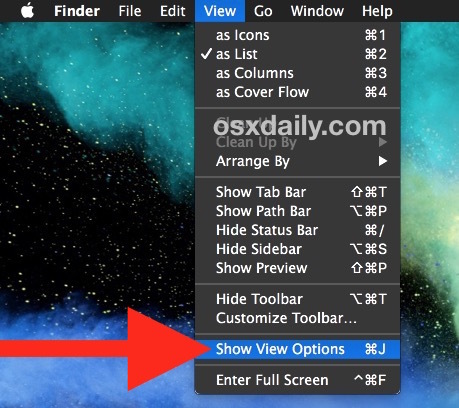 * View settings impact only the Finder folder currently open, however you can choose the “Use as Defaults” button to set your options chosen here as the default view options in other Finder windows on the Mac. Shown above we chose “Date Modified” as the column type to sort files by in the Library folder. If the little arrow next to the date column is pointing down, that means the most recent dates will be shown on top. If the little arrow next to the date column is pointing up, that means the oldest dates will be shown at top. You can click the date column to toggle this back and forth, my personal preference is for the most recent dates to be shown on top but every user is different. My personal date-based sorting favorites are Date Modified and Date Last Opened. I find using “Date Last Opened” in All My Files to be particularly useful while “Date Modified” I prefer for the other files and folders on a Mac. The Date Last Opened sort setting can be particularly useful to find out the last time a particular file or app was accessed on a Mac either for your own needs or for snooping purposes, for example if you’re a parent wondering when the last time a particular video game app was played, you could find that out by sorting the containing folder by Date Last Opened to reveal when such an application was last launched (“I swear I was doing homework!”). This reveals a little dropdown menu that you can choose the various sorting options from as well. Remember you must be in List view of Finder to have the date based sorting options available to you this way. This obviously relates to sorting files in the Mac Finder, the visual file system in Mac OS, but if you’re a Terminal dweller you can sort ls by date at the command line too, which is equally as useful. Do you have a particularly favorite approach to sorting your files by date, or by another sorting method entirely? Share it with us in the comments! This is a subject that on macOS drives me crazy. If I change the view options for a folder in a hierarchy, it changes for all the folders above that one as well. It doesn’t matter what view I am in, I have a folder A which contains folders 1-10, those folders have files. If I open any one of those folders 1-10 and sort the files in any way it propagates back up the chain and now folders 1-10 are sorted the same way as the files. I just assumed that this is one of many small annoying bugs in macOS, are you saying that you do not have this issue? This is indeed useful. However you cannot do this within dialog boxes such as the open file (command-O) dialog box. I only get “Date Added” and have not found a way to get these other choices such as “Date Modified”. Right-click (or control click) in the column choices from an Open or Save dialog box and you can toggle various sorting options on or off, including the date sorting for files. Den4b ReNamer is my favorite utility on windows. I miss it so much that I run in in a wine bottle on OSX sometimes. What is a good replacement?